For the month of October, Capalbo’s Gift Baskets is donating a portion of proceeds towards breast cancer research from the sale of their popular fruit baskets, wine and champagne baskets, and gourmet food baskets. As everybody should know by now, October is Breast Cancer Awareness Month. To show their support, Capalbo’s Gift Baskets will be donating a portion of all proceeds towards breast cancer research. Now through October 31st, using promo code BC13 at checkout will automatically take 15% off all products on their website, except for items already on free shipping. It’s time to think pink, with the Think Pink Wine Gift Basket with wine by W, a refreshing rosé blush wine, and a pink-wrapped box of handmade chocolates and truffles. Or send the Gourmet Dream Ceramic Centerpiece, a dreamy gourmet centerpiece with truffles, chocolate dipped cookies & pretzels, toffee and nuts in a festive ceramic polka dot bowl, plus, an added surprise – a Flowers in a Can Seed Growing Kit. Capalbo’s Gift Baskets, the largest gift basket provider in the tri-state area for over 100 years, has a wide selection of gifts, from wine and champagne baskets to gourmet food and fruit baskets.They are fully stocked with Rosé wine, Chardonnay, Pinot Grigio, and reds like Cabernet Sauvignon, Pinot Noir, Merlot, among others. Celebrate any occasion by sending a delicious wine basket, fresh fruit basket or gourmet food basket ideal for a birthday gift, anniversary gift, engagement and wedding gifts, and graduation gift. Send a thank you basket, or a congratulations basket for a job well done. Capalbo’s Gift Baskets also has appropriate get well baskets and sympathy baskets when you need to make a statement and words will not suffice. Each basket from Capalbo’s Gift Baskets is created and designed in their 40,000 square foot facility in NJ. 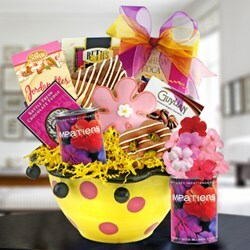 They will also personalize your gift message, at no additional charge. Customers can order via the website, capalbosonline.com, on their desktop or mobile device. The baskets and gifts can also be seen in person at their retail store, located at 350 Allwood Road in Clifton, NJ 07012, just across from the Clifton Promenade Mall. Capalbo’s Gift Baskets provides fast, fresh and delicious gourmet fruit & food baskets, wine & champagne baskets, gift towers & tins and baby gift baskets to customers nationwide. Every basket is backed by a 100% unconditional satisfaction guarantee which has been the Capalbo promise for over 100 years. Customer Service Representatives, all friendly and knowledgeable, are available to assist from 9:00am to 6:00pm weekdays by phone at (800) 252-6262 or via live online chat. Visit their sister sites, winebasket.com for wine, champagne and gourmet food arrangements, and babybasket.com, for all newborn baby gift needs.